Let the Flickr record show that on Thanksgiving Day, 23 November 2006, Laura Lane and Lyndon Wong ran across the Golden Gate Bridge and got engaged at Kirby Cove. and displays some photos capturing the occasion. Woohoo! Congratulations, Lyndon and Laura! 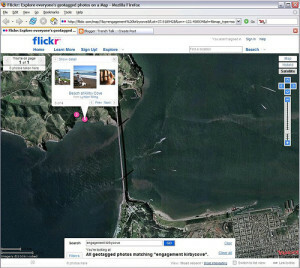 The weird thing is that I coming to your blog to note that Panoramio.com has finally done the whole geo-located photo thing that you and I discussed many, many years ago. But here I find you’ve already discovered it at flickr. But forget about all that crap: congratulations! I’m very happy for you.